Who gives away storage containers? Those 12 gallon, 18 gallon or larger plastic storage crates seem to take up 90 percent of the space in the housewares department of my local Walmart. Stacks upon stacks of them sit on shelves and in the middle of aisles, and you can’t visit the store without seeing at least one person leaving with a cart full of them. Rather than clearing away junk, most of us hide it, hoping to organize it another day. But the tubs go into the garage, storage building or spare bedroom closet and never come out again. An industry is built upon our desire to contain the things that invade our home. But there is another way. 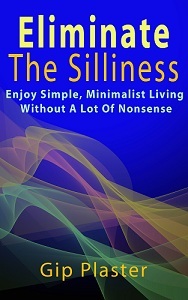 There’s a more minimalist approach to life that’s about removing the clutter rather than containing it. As the weeks of my Decluttering and Simplifying 2010 project pass, I’m getting more comfortable with a new label for myself: minimalist. My cluttered home looks more like a country cottage than a sleek, clean, modern home, but my mindset is changing, and my life is changing along with it. The living room isn’t completely decluttered yet (yes, that’s dragging on too long), but with very minimal effort we’ve located eight storage containers that we either never fully utilized or have been cleaned out. I checked with my mother to see if she needs any containers, and since she doesn’t, they’ll be going to Goodwill on my next trip. In other decluttering news, we threw away three boxes of heavily damaged books (rejects from my book business) that were worthless and too badly damaged to sell to a used bookstore. Some other bits and pieces found their way into the trash. The books, the bits and the weekly household trash make for a full dumpster once again. Today was actually filled with cleaning and decluttering tasks, but since the cleaning was laundry and vacuuming, that hardly counts toward my project. And the other decluttering involved clearing some dead stock from my book business, so that doesn’t really count either. Still, they add to my sense of accomplishment today. Next week, I’m due for a trip to the charity shop to drop off those containers and other items. And we really need to finish cleaning the living room. Really.